Innovative Bold Styling: If dropping the awesome 5.0L Coyote into your Fox Body is in your plans, then ARH has what you need. 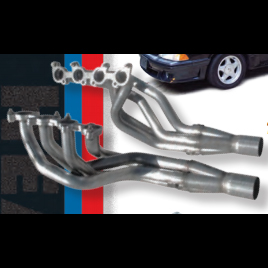 Originally developed for NMRA Coyote Stock Class, our 1-3/4 swap headers have set records and will work just as great in the street. With 100% US construction using high quality 304 S/S, it doesnt get better. Features include, 3/8 thick tig welded and hand ported flanges, individual tubes for easy installation and slip on merge collectors with scavenger spikes. Our goal was to make your Coyote swap hassle free on the exhaust side. Tubular K-member is required. American Racing Headers are factory equipment on the 2010 Ford Mustang Cobra Jet. Quality Construction: No one else can Stack up to the bold clean styling of our aftermarket Billet / Stainless Steel Dress Ups, Street / Strip / Racing Suspension and Performance Parts for your American Muscle Car like UPR Products! Fits these Vehicles: 1979 1980 1981 1982 1983 1984 1985 1986 1987 1988 1989 1990 1991 1992 1993 Ford Mustang LX GT with Coyote 5.0 engine Steeda Roush & Saleen Vehicles.